The Behavior of cats is largely based on a routine. Cats are creatures of habit. In the wild they follow a daily and nightly routine. In the wild this is dictated by the level of light. Even nap times can often fall at the same times both day and evening which the animal might see as a slow spot with little activity. Cats prefer to patrol their territories in the same systematic way day after day. 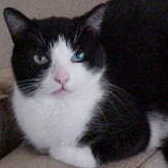 Felines are very sensitive to changes in their environment because changes might be a sign of a disturbance or danger. A thorough patrol can help sooth jangled nerves and put the animals fears to rest. When cats are domesticated they still live for that daily routine. Cats like to do today what they did yesterday, and the day before and would prefer to do the same thing tomorrow. In my opinion the behavior of cats does not include the human emotion of boredom in the same way it applies to humans. Cats have an inherent very strong biological clock. They quickly learn when it is time for food, or when it is time for a certain person to get up in the morning. I personally am not sure how with pinpoint accuracy they are able to determine exactly what time it is. For example five minutes before my alarm clock rings at 5:23 a.m. My cat Thomas gets in position to greet me and to make sure I get out of bed. Felines in the domesticated role can also become very sensitive to any unusual activities in the home such as preparations for moving or packing your stuff to go away on vacation. Big events can disturb the behavior of cats. This may be expressed in a lack of appetite or hiding in a place where they are not usually found. A good course of action during these activities is to provide extra attention to the cat. Or a few extra cat treats to assure the feline that everything is okay. Sometimes cat behavior is based on routine and consistency in the way that you and your family treat your cat. When I talk about consistency you do want to established guidelines for your feline friend that the whole family will follow. It can be confusing to the animal if it is all right to sleep in an armchair on one day but not the next day. This also applies to when one human tells the cat it’s okay to sleep in that chair and then another will walk in and chase him away from the same chair. The family must get together and design a plan of consistency of what your cat can do and can not do. A confused cat can develop a behavior problem. They’re willing to accept restrictions on where they can go, but they cannot be expected to follow rules that aren’t consistent. To improve the behavior of cats you must make a rule then stick to that rule no matter what.